THE UNIT INCLUDES all furnishings required for normal living conditions. All of our vacation rental properties provide linens (sheets, pillowcases and towels sets) for your use while you are on vacation. Pillowcases are provided for bed pillows only and not for extra pillows that may be in units. The linens are delivered on the day of your arrival and then picked up on your departure date. Daily maid/linen service may be obtained for an additional fee upon request prior to check-in. For stays lasting longer than 28 days, linens and towels are NOT provided. Pillows, bedspreads and blankets are provided, however, these are to be used as bedding only. You must bring your own blankets and towels for use on the beach, on the balcony, by the pool, etc. Guests will be charged to launder mattress pads, blankets and/or pillows that have been used improperly. Units are setup for housekeeping, including cooking and eating utensils. Expendable items such as soap, bathroom tissue, paper towels, cleaning products, etc. are the responsibility of the guest. All units are equipped with basic cable hookup for TV. Some properties have a telephone provided for local phone calls and if so the phone number will be provided to you on your check-in packet. Each rental unit is set up with internet access, although this service and type are not guaranteed. THIS PROPERTY IS privately owned and management reserves the right to refuse service to anyone and will not be responsible for accidents or injuries to guests or for loss of money, jewelry, or valuables of any kind. We are pleased to offer monthly rentals during the off season. As all properties are individually owned, some owners do have minimum stay requirements. All stays that are 90 days or longer are tax exempt. The full payment for the first month is required to confirm with-in 1 week of booking the reservation. Sequential month’s rents are due between the 1st and 5th of said month. A one-time departure cleaning fee is added to the first month’s rental. Security deposits are required and are equivalent to 1 month’s rent payable 30 days prior to the arrival date. Guests that are staying 30 days or longer will need to make all payments with check or money in order to avoid a monthly credit card processing fee. For each month that a guest stays, they will be required to sign a rental agreement within 24 hours of booking. Once rental agreements are signed, guests are obligated to full lease terms or will forfeit security deposit. Although electric utilities are included with monthly rentals, the electric is capped at $50 for 1 & 2 bedrooms, $75 for 3 bedrooms and $100 for 4 bedrooms and guests are responsible for any overages. Linens (bed sheets and towels) are NOT provided for monthly rentals. We accept MASTERCARD, VISA, DISCOVER, check or money order. Last minute reservations and internet bookings must be paid with credit card. Guests that are staying 30 days or longer will need to make all payments with check or money in order to avoid a monthly credit card processing fee. The reservation deposit required is half of the total amount paid within 24 hours. Please advise at the time of booking if you are sending a check, so that we can allow for extra time for payment to be received. Please note that checks will not be accepted when the arrival day is within 30 days. We may accommodate regular payment schedules as needed. Just ask one of our vacation specialists prior to booking. There will be a $50.00 fee charged to your reservation for credit card declines and returned checks. Declined credit cards will not be processed a second time nor will returned checks be re-deposited. Final rental payment on all reservations is due 30 days prior to the arrival date. A late fee of $50 will be assessed to all accounts not paid in full 30 days in advance. All deposits and rents will be deposited into an interest bearing escrow account with the interest accrued to the credit of Oceanfront Vacation Rentals, Inc.
Oceanfront Vacation Rentals strongly urges each guest to consider taking the optional travel insurance offered. Cancellation of a reservation is required by guest of record in writing by mail, email or fax. If a guest declines the travel insurance, the property must be re-rented for the full time period and for the same amount of monies before a refund will be offered. If these conditions are met, a $75 cancellation fee on condominiums or a $250 cancellation fee on houses will apply. If property is not re-rented for the full time period of the cancelled reservation and for the full gross rate, all monies paid will be forfeited due to the availability of travel insurance. The reservation fee is NON-refundable. If state or local authorities order a mandatory evacuation of the area where the premises are located, no refund of any monies paid will be made to Tenant, nor will a stay be allowed at a later date, due to a hurricane evacuation or other natural catastrophe, or the unavailability of Travel Protection Insurance due to the current existence of named storm at the time a reservation is made. Oceanfront Vacation Rentals, Inc. is pleased to offer CSA Travel Protection Insurance to protect your vacation investment in case of an unforeseen circumstance. Also, no refund will be made for the period of time the area may be closed following an evacuation due to hurricane or other natural disaster. Oceanfront Vacation Rentals, Inc. strongly recommends Travel Insurance. Check-In is between 3-5 PM (until 6 PM during the summer months). Oceanfront Vacation Rentals will work diligently to ensure that all properties are clean and ready for occupancy by 3:00 PM. However, in certain situations, it may be necessary to delay occupancy until the property is ready. ALL GUESTS MUST CHECK IN AT OUR OFFICE (NOT THE RENTAL PROPERTY) TO RECEIVE A KEY! Our office is located in the 21st Avenue Professional Center at 1551 21st AVE. N., MYRTLE BEACH, SC 29577. Please be prepared to provide identification prior to receiving your check-in packet. Once you arrive at the rental property, we ask that you take a moment to look around and make sure that everything is in order and how you would expect it. YOU should notify us immediately of any missing or inoperative furnishings or equipment or of any weak or unsafe conditions which may result in injury. Occupancy by you and/or your party shall be conclusive evidence that the unit is in rental ready condition and is as represented. Please give us the opportunity to take care of any concerns that you may have and do not wait until you are checking out to make us aware of problems. Check-Out is 10:00 a.m. All properties must be vacated by 10:00 a.m. sharp on check-out day or guests will be subject to a late check-out fee of $50 per half hour plus tax during the summer months. Check-in and check-out times are strictly enforced so our staff will have adequate time to make sure each property is in good condition for your vacation. Your cooperation will be appreciated. Please call our office at (843) 448-1700 or email us the day before at info@oceanfrontvac.com if you will be arriving after hours. We will arrange to leave your check-in packet in our lockbox. Our office hours are 9:00AM-5:00PM, Monday-Saturday (except holidays), with closing time extended to 6:00 PM during peak summer weeks. Keep in mind that if you arrive after hours, we may ask that you come by our office on our next business day to officially check-in. Condominium parking is limited. PLEASE OBSERVE MAXIMUM 2 VEHICLES PER CONDO with a few properties allowing 1 parking pass only. If you are traveling in anything other than a vehicle (car, SUV, van, truck), please inquire about property restrictions to see if permitted. Parking for motorcycles, trailers, RVs, boats, etc. are not guaranteed so please check with a guest service representative to confirm if this is allowed on the property that you have rented. Guest agrees to indemnify and hold harmless Agent and owner from theft or damage to vehicles or their contents. Two keys are provided per rental unit upon check-in. Access codes for properties with keyless entry will be provided in the check-in packet. Guests are responsible for any and all keys issued. There will be a $25 fee charged to your account for each key not turned in. Certain keys such as building access keys, security keys and pool keys have a replacement charge of up to $75. There is a charge for all lock-out calls. This charge ranges from $50 to $100. Please be aware that cash payment is required PRIOR to you obtaining access to the property. Please call (843) 448-1700 and listen for the prompts for assistance. We CANNOT guarantee air conditioning, appliances, pools, hot tubs, elevators, etc. There will be NO REFUND upon their failure. 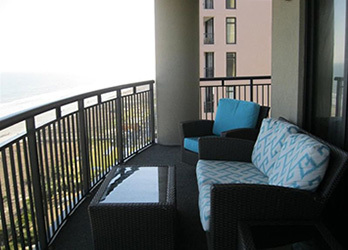 Oceanfront Vacation Rentals makes every reasonable effort to assure that all remains in good working order. Our best will be done to have any malfunction repaired as quickly as possible. Overcrowding will not be permitted. Maximum number of guests allowed is listed in the description of the property. Oceanfront Vacation Rentals, Inc. caters to families and adults that are 25 and older. If you are not a family which includes married couples, everyone in the group must be 25 years of age or older. Please be prepared to show photo ID. No Parties Allowed! The person, who rents the property, must be the person checking in, staying and checking out. Failure to comply with the age requirements will result in eviction and loss of all monies paid. 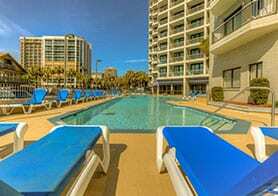 Tenant agrees that Oceanfront Vacation Rentals, Inc., the owner or their respective representatives may enter the premises during reasonable hours to inspect the premises, to make such repairs, alterations or improvements hereto as Oceanfront Vacation Rentals, Inc. may deem appropriate. Absolutely no grilling allowed on balconies, decks or porches. Grill only in designated grill areas. Fireworks are also strictly prohibited. Please refer and abide with local laws. We know that you would like to bring your pet with you on your vacation. 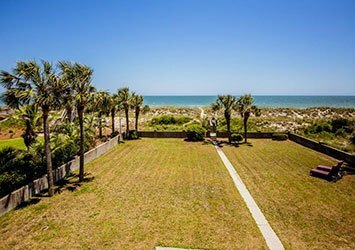 Please take a look at the pet-friendly properties that Oceanfront Vacation Rentals, Inc. has to offer you. Unless specifically permitted in this Agreement, no pets shall be allowed on the premises. For the properties that are offered as pet-friendly, certain restrictions such as weight and type of pet will apply. Please speak with a vacation specialist to disclose pets. There will be a non-refundable pet fee of $150 per pet for vacation rentals or a non-refundable pet fee of $250 per pet on monthly rentals. In addition, tenants take sole responsibility for their pets, including cleanup. In the event that an owner of a vacation rental unit elects to remove his property from our management responsibility we will provide comparable accommodations or grant a full refund. We reserve the right to substitute suitable accommodations if circumstances require. Remove all food from cabinets, refrigerator and freezer. DO NOT leave any food in the rental property. Wash all dishes, cookware, bakeware, etc. and return them to original location. Leave bed linens on beds so that the cleaning company can inventory and sort by size. All towels, washcloths and hand towels are to be left on bathroom floor. RETURN KEYS TO OCEANFRONT VACATION RENTALS, INC. OFFICE. FAILURE TO COMPLETE THESE ITEMS WILL RESULT IN CHARGES RETAINED FROM YOUR SECURITY DEPOSIT. This agreement shall be governed by and interpreted in accordance with laws of the State of South Carolina. This agreement shall be treated as though it were executed in the County of Horry, State of South Carolina, and were to have been performed in the county of Horry, State of South Carolina. Any action relating to the agreement shall only be instituted and prosecuted in courts in Horry County, South Carolina. Lessee/Tenant specifically consents to such jurisdiction and to extraterritorial service of process.